If you're all about being comfortable when it comes to figuring out an outfit, this combination of a black leather biker jacket and R 13 r13 skinny jeans is just what you need. 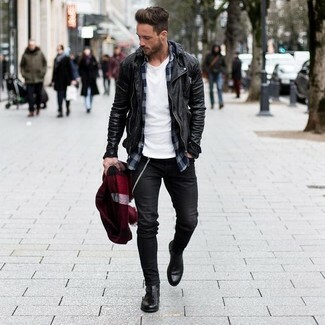 Make black leather casual boots your footwear choice for a masculine aesthetic. If you're looking for a casual yet seriously stylish look, team a grey field jacket with R 13 r13 skinny jeans from farfetch.com. Both garments are totally comfortable and will look great together. Got bored with this look? Enter dark brown leather desert boots to spice things up. If you prefer comfort dressing when it comes to your personal style, you'll love this stylish pairing of a black leather biker jacket and R 13 r13 skinny jeans from farfetch.com. Black leather chelsea boots will bring a classic aesthetic to the getup. 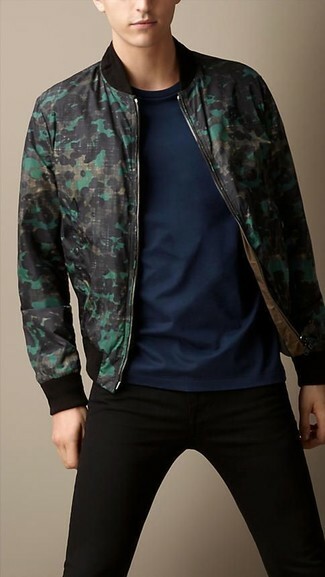 If you're a fan of relaxed dressing when it comes to your personal style, you'll love this on-trend combination of a dark green camouflage bomber jacket and R 13 r13 skinny jeans. If you use a more relaxed approach to dressing up, why not marry a grey blazer with R 13 r13 skinny jeans? Let's make a bit more effort now and make brown leather oxford shoes your footwear choice. 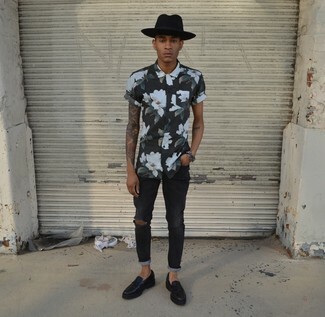 Team a black and white floral short sleeve shirt with R 13 r13 skinny jeans from farfetch.com if you're hunting for an outfit idea for when you want to look casually cool. 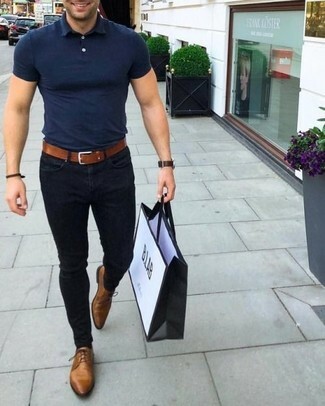 Let's make a bit more effort now and choose a pair of black leather loafers. If you're hunting for a casual yet seriously stylish outfit, go for a navy cable sweater and R 13 r13 skinny jeans. Both garments are totally comfortable and will look great together. Spruce up your look with tan leather casual boots. If you're all about functionality dressing when it comes to your personal style, you'll love this stylish combination of a navy polo and R 13 r13 skinny jeans. You could perhaps get a little creative in the shoe department and dress up your outfit with brown leather oxford shoes. 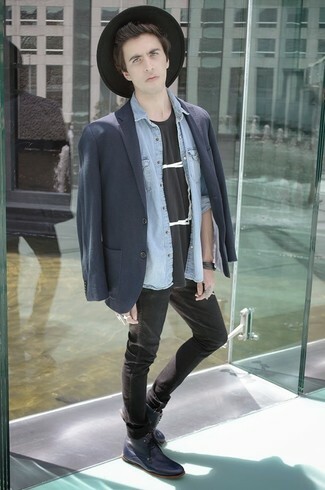 If you're hunting for a casual yet seriously stylish look, reach for a charcoal blazer and black skinny jeans. Both items are totally comfortable and will look great together. 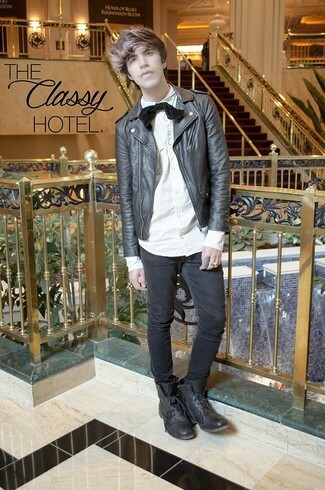 When it comes to footwear, this ensemble is complemented wonderfully with navy leather desert boots.